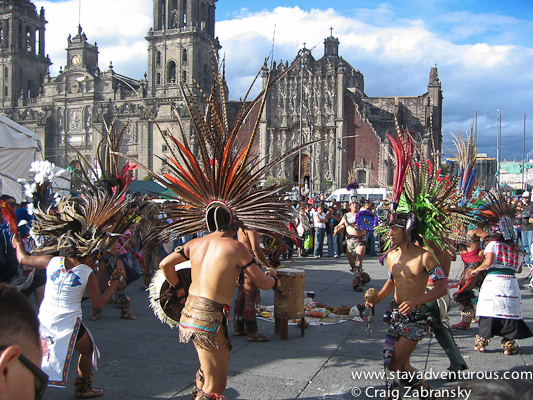 Stay Adventurous in Mexico City and travel this great capital city with me. 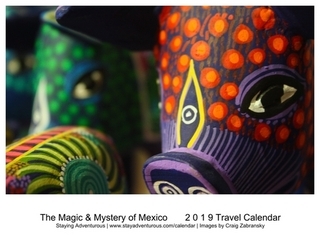 Learn to see Mexico and life differently as you travel through one of the world’s best cities and experience Mexico through my eyes, heart and soul. When: 2018 Dates to be released. Before we enjoy dinner at Azul Historico, we will experience a beautiful rooftop sunset over the Zocalo. Today we start at the famous Basilica of Our Lady of Guadalupe to see the cloak with the image and learn about the Catholic pilgrimage. 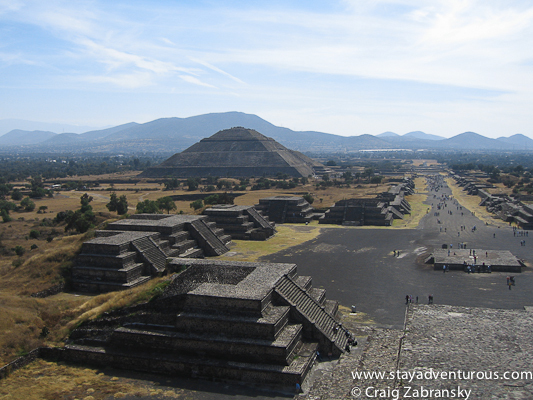 Next up we are off to visit Teotihuacan, one of the most important and influential centers of the Mesoamerica. 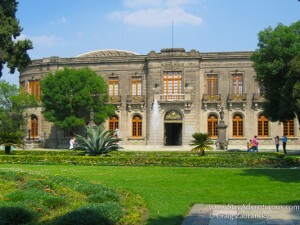 The people and architecture, art and culture had a great influence on many of the other cultures within Mexico. an expert archeologist, who worked at this site, will show us some of the lesser visited regions and also walk us through the Avenue of the Dead, where we can see and climb both the pyramids of the Sun and the Moon. 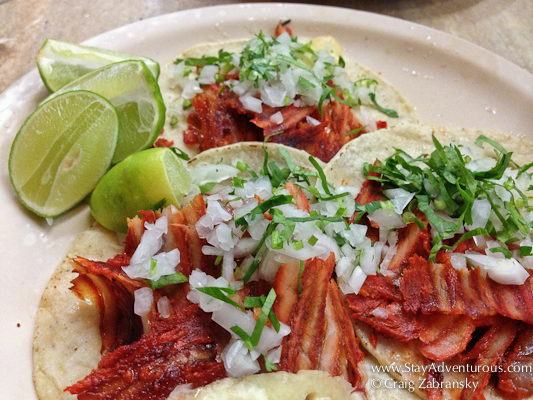 Returning to Mexico City, we will enjoy a tacos at one of my favorite places. San Angel and Coyoacan Neighborhoods. 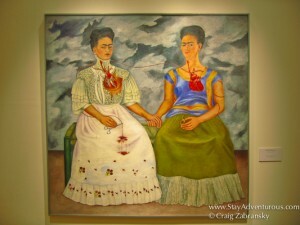 Exploring Bazaar Sabado and the World of Frida Kahlo! The place to be on Saturdays is in the Southern part of Mexico City. 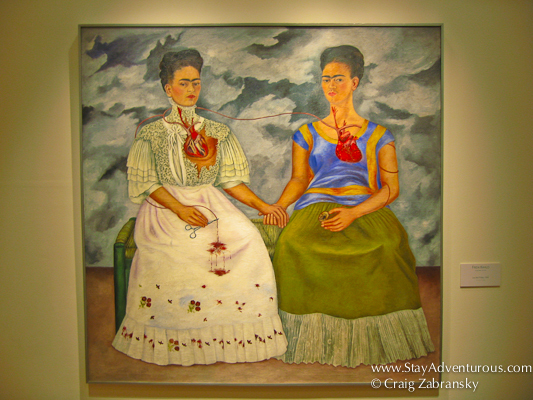 We begin in the bohemian neighborhood of Coyoacan, where we will tour the Frida Kahlo Museum, or “Blue House.” Then, we we’ll stroll in Coyoacan to see visit some favorite haunts, restaurants, markets, to view one of my favorite areas of the city to relax. We will enjoy the “mercado de antojitos” for a local lunch and then we will visit a local mezcaleria to taste mezcal…tequila’s smokey cousin, while people watching on the town square of Coyoacan. 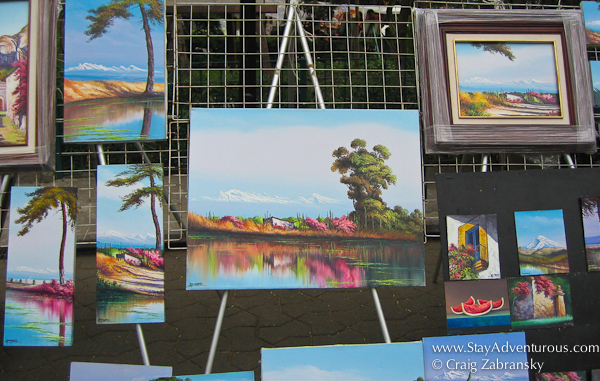 Then we visit to the Bazaar Sabado in San Angel, where we will visit the artists at Plaza San Jacinto and see other fine artisans of Mexico. 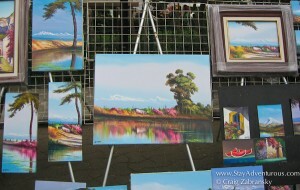 It is a favorite pastime of the locals and a great place to spend the afternoon. We return to the hotel to rest a bit before our “night on the town” in Colonia Condesa and Roma to see how the local D.F people live. These neighborhoods are trendy, artsy and are where some of Mexico City’s best and emerging restaurants, mixology bars and art galleries are located. Today, we will explore the art of Sunday in Mexico and experience its family day. The day will be free of guides except for me. 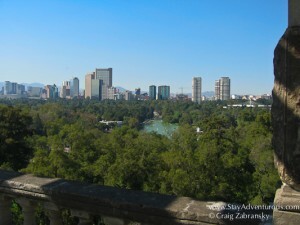 We will start with an adventurous bike ride on the main Paseo de la Reforma to the Zocalo and then into Polanco. Eventually we will visit Chapultepec Park to watch the locals enjoy their family time and see how romantic the city can be. We will also visit some unique monuments, including a castle to to take in expanding views of the city. Then depending on your flight schedule, we will enjoy look to brunch close to Chapultepec Park before heading back to the hotel and then the airport. Personal Items: cabs, laundry, etc. Again, this tour is run in conjunction with Tia Stephanie Tours. Sign up and payments will be completed through her site. Thank you Stephanie. This sounds amazing! Will start looking at flights right now! 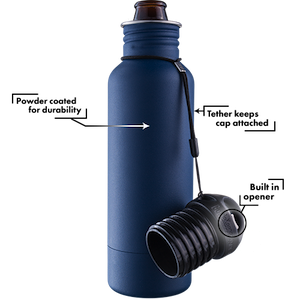 This does sound amazing – but too soon for us – we need at least a few months to plan with the kiddos and jobs and figure things out – is there a mailing list? Thanks Lyn, there will be others… as for a mailing list – sure, it is on the right column on this page (or all pages) under Subscribe Here. I can add you. Very, very cool, Craig! Good luck with everything. You are so first ballot with this. 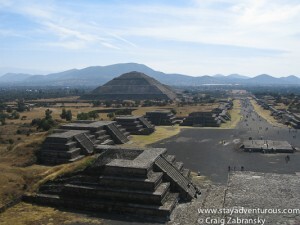 I would love to check out the Mexico sunsets on a Stay Adventurous tour! I want to go on this!! Wish I had off from work when you would be there. So fun! Craig, I’ve sold hundreds and hundreds of tours and know that this itinerary is utterly sublime. 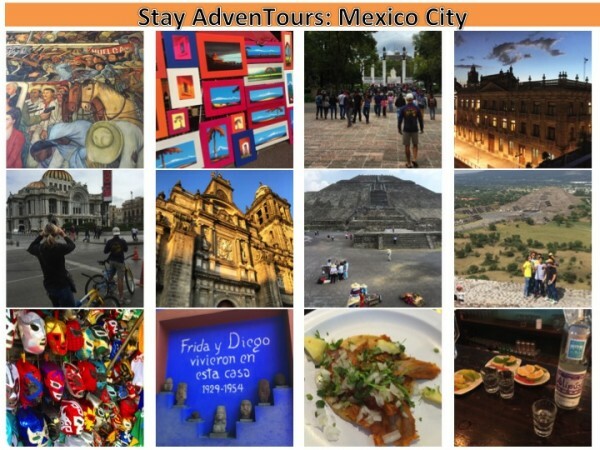 I would suggest that in the future, you offer “add ons,” e.g., a Tia Stephanie guided tour (you don’t have to go along) to Oaxaca and Puebla, as well as a choice of a week or so at several beach resort areas, with transfers from Mexico City included. That lets people book conveniently everything at once and not worry about how things coordinate. We are used to Mexico and do not feel intimidated by a transfer from Mexico City airport, but keep in mind that some on your tours may have little or no travel experience outside of Canada and Mexico. I would make it even more clear that they can book trusted guided transfers at the same time as the tour. I like, though, that unlike some tours this would be an optional expense. 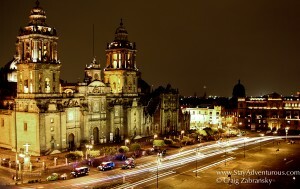 As for your activities in Mexico City itself, perfect! Don, thanks…. this made my day…to see such an expert appreciate the itinerary. Actually for 2016, I need to add two things too… a visit to the Basilica de Guadalupe on the way to Teotihuacan (Friday) and then bike rides on the Paseo de la Reforma (Sunday) too before Chapultepec Park. I agree on making a longer tour too with Tia Stephanie, we are discussing how to make that work too…. she has been really helpful. Thanks, Craig. The Basilica de Guadalupe one of the most moving travel experiences I’ve been privileged to have. Noticed that I didn’t proofread as usual. That ” little or no travel experience outside of Canada and Mexico” meant outside of Canada and the U.S. This was a great post. I’d love to do a solo trip to Mexico someday! I love their culture and I adore Mexican food (probably one of my faves).